Ammonium Nitrate Market size estimated at USD 16.3 billion in 2018 and will grow at a CAGR of more than 4% from 2019 to 2025. 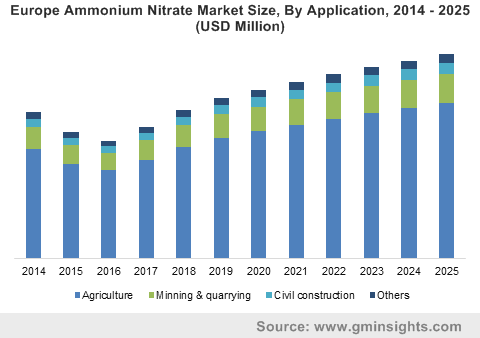 The global ammonium nitrate market will be primarily driven by the increasing product application in various end-user industries like agriculture, mining & quarrying, civil construction. Ammonium nitrate is majorly used in fertilizer and explosive manufacturing. Increasing food safety concerns around the globe has led to concerted efforts by governments, farmers and institutions to increase the yield per unit area of cultivated land. This has led to a significant rise in fertilizer demand in recent years across the globe. Additionally, increasing mining & quarrying activities in the U.S., Africa and Asia Pacific region has led to a rise in the demand for civil explosives. These factors will drive ammonium nitrate demand during the forecast period. The agriculture industry is a key end-user for the product market where it is used as a nitrogen fertilizer. In India and the US, arable land per person was 0.18 & 0.74 hector per person respectively in 1990 which was reduced to 0.11 & 0.47 hector per person in 2016. At a global level, arable land per person was 0.23 hector per person which was reduced to 0.19 hector per person in 2016. Increasing global population has increased the demand of the food to a great extent. Thus, the yield has to be increased in proportion with the increasing population in order to maintain the balance between the demand & supply and to do so, high-quality fertilizers are required. The rising agriculture industry across the globe has triggered the demand of fertilizers which are essential for the growth of the crops. Nitrogen fertilizers have lesser nitrogen content (33%) as compared to urea-based fertilizers (46%). Plants consume nitrogen in anitrate form which is readily available in ammonium nitrate. the conversion of nitrogen component in urea into anitrate results in high nitrogen loss. In addition to that, ammonium nitrate-based fertilizers release nitrogen in the atmosphere at a much slower rate which improve the longevity. Thus, ammonium nitrate-based fertilizers are extensively used in the agriculture industry. The significant increase in the demand for high-quality crop has increased the fertilizer consumption. China, one of the leading fertilizer manufacturers in the world, was the largest consumer of the nitrogen fertilizer in the world. This has led to the remodeling and expansion of the older manufacturing plants along with building the new ammonium nitrate production facilities to meet the escalating demand. In 2016, Yara International opened the world’s first modular plant to produce ammonium nitrate with the annual production capacity of 330,000 tonnes. The market may face challenges from the substitution of ammonium nitrate by other compounds such as UAN, NPK, etc. for the fertilizer applications. Being declared as the moderately hazardous material, OSHA (Occupational Health and Safety), EPA (Environmental Protection Agency) and ATF (Bureau of Alcohol, Tobacco and Firearms) issued strict rules regarding the production, storage, transportation and usage of ammonium nitrate to prevent the misuse of the product in an act of terrorism. This will hinder the growth of the ammonium nitrate market as the usage of the other available substitutes has increased in the fertilizers and explosives application segments. Based on application, global ammonium nitrate market has been segmented as high density (HDAN), low density (LDAN) and solutions. High density ammonium nitrate is the major contributor in terms of both volume & revenue and will gain at a rate of more than 4.5% during the forecasted timeframe. High-density ammonium nitrate prills are used as a solid-oxidizer agent in the agriculture industry. This product type is effective in wet climate conditions due to its purified, non-porous, quality-dense prills and maintains the technical specifications in such situations. 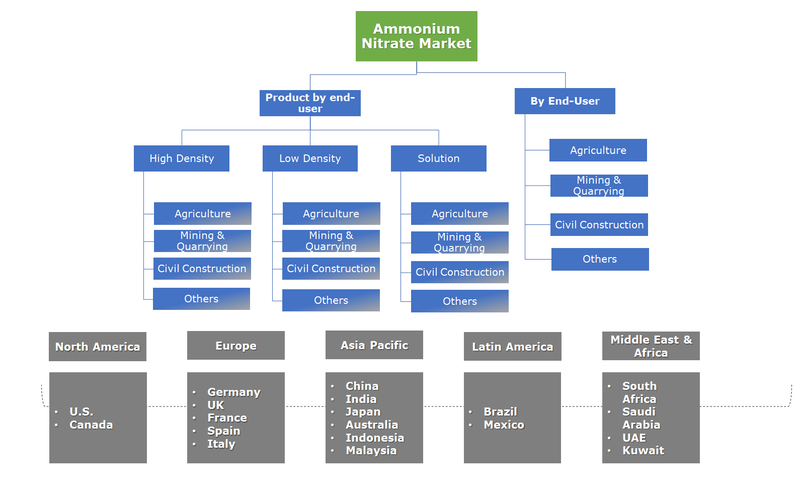 On the basis of end-user, the global ammonium nitrate market is classified into agriculture, mining & quarrying, civil construction, and other end-users including defense, pyrotechniques, etc. Agriculture is a major end-user industry in the product market. The segment will grow by around 4.5% CAGR during the forecast period. Ammonium nitrate is primarily used as a fertilizer to enhance the growth and quality of the crops and plants as well as in manufacturing other nitrogen fertilizers such as urea ammonium nitrate (UAN). Civil construction is also an important end-user industry which is poised to grow by around 4% CAGR during the forecast period. The product is extensively used as an explosive in the civil construction industry for road making, tunneling, excavation for railways, concrete dams, delay detonators, secondary blasting, etc. Europe is the largest ammonium nitrate market globally, accounting for nearly half of the product demand in 2018 and will grow by more than 4% CAGR. Regional industry will be mainly augmented by rapidly increasing demand for civil explosives for escalating mining & quarrying and construction activities. The U.S. is an important ammonium nitrate market accounting for more than one-tenth of the overall industry size in 2018. Rising agricultural activities, stable growth in the construction sector, coupled with increasing oil exploration and mining & quarrying activities will drive the regional demand of the product. The major players in the market are Yara International, EuroChem, Ostchem and Uralchem. The other players in the industry includes Orica, CF Industries Holdings, Enaex S.A, Austin Powder International and many more. Majority of the market players have adopted the backward integration strategy and are involved in the production of raw materials, processing and manufacturing of the finished products. In 1659, ammonium nitrate was first produced artificially in Germany. It is a white, crystalline solid, highly soluble in water, stable at lower temperatures but it decomposes explosively at the temperatures above 390°F (200°C). It is primarily used in fertilizers and explosives. The growing demand for fertilizers, rising mining activities, increasing food demand in the world will drive the growth of the ammonium nitrate market. However, stringent government regulations to prevent the misuse of the product coupled with the availability of the substitutes in end-user segments will hamper the growth of the market.